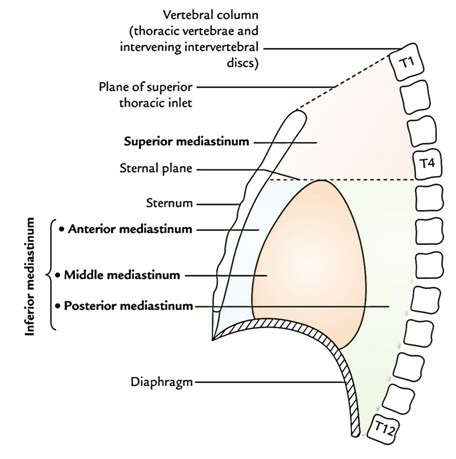 Posterior: Bodies of upper 4 thoracic vertebrae. Superior: Plane of superior thoracic aperture. Inferior: An imaginary plane going through the sternal angle in front and lower border of the body of fourth thoracic vertebra behind (transverse thoracic plane). (c) Left common carotid artery. (a) left and right brachiocephalic veins. (b) Upper half of the superior vena cava (SVC). (c) Left superior intercostal vein. (a) Phrenic nerves (left and right). 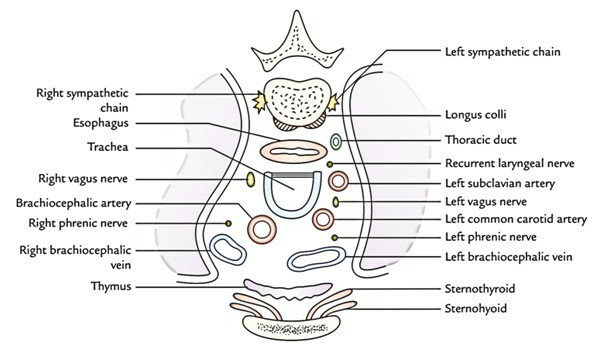 (b) Vagus nerves (left and right). (c) Sympathetic trunks and cardiac nerves (left and right). (d) Left recurrent laryngeal nerves. 5. 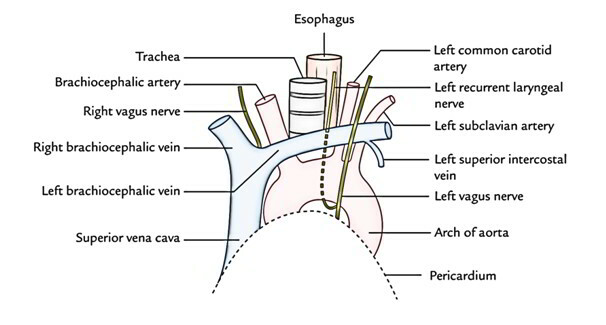 Esophagus and thoracic duct. Potential dead space in superior mediastinum: In superior mediastinum, all large veins (superior vena cava, left and right brachiocephalic veins) are on the right side and all the large arteries (arch of aorta and its 3 branches) are on the left side. Consequently, during increased blood flow, the large veins expand enormously while the large arteries don’t expand at all. This is because there’s sufficient dead space on the right side. It’s into this space that tumors of mediastinum tend to project.